Announce special occasions in style with premium quality invitations. NavPack & Print understands what events like wedding, house warming, baby showers, anniversaries or birthdays mean to you. You can go creative all the way and follow the latest trends while printing invitations. The essence of your warmth must reflect in your invites. 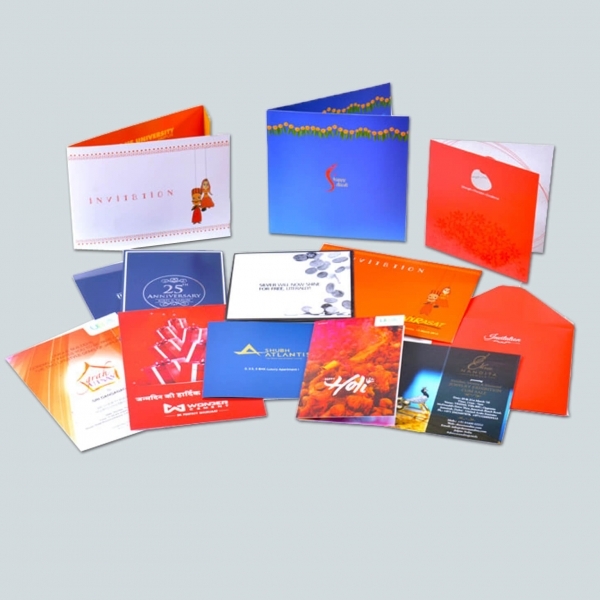 Appealing and attractive invites will surely fetch you lots of compliments too. We don’t use old fashioned templates to print your invites. We provide you complete freedom to customise it anyway you like. You can add any number of colours, creative cuts and finishing to your invites. The reason behind our fabulous printing services is the level of detail oriented work that goes from pre-press to post press print stages. We quickly prototype your ideas and show you amazing prints, discussing the modifications within 24 hours. With German equipment and printing experience for so many business verticals – we are the most sought after printing agency in Jaipur. Want more marketing materials to be printed? We deal in brochure, book, catalog, visiting cards printing too. We specialise in tailor made solutions and believe in 100% customer satisfaction. You can order in large numbers or less, we promise on-time delivery for both. Call us and talk to the experts.